This series follows how the fiancée, Jeanie manhandled Brandon, wrecked his bike and finally, resigned herself to fate in classic Michelangelo’s “The Creation of Adam” style and let him continue his indulgence in motorbikes. 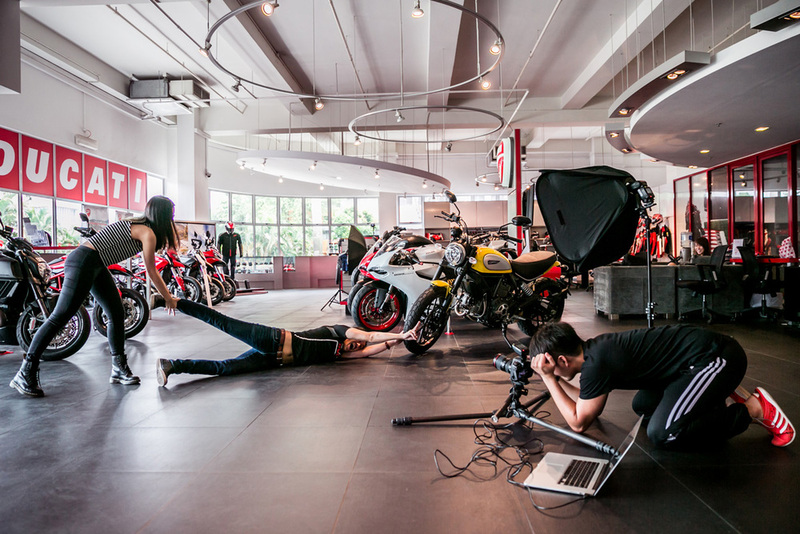 The Ducati showroom, normally closed on a Sunday but the owner was kind enough to let us in for a pre-wedding photo shoot. We only had 2 and a half hours in there, it was a race against time. On-site planning was essential. Brandon, an art director by trade, briefed us on his idea and concept for his very own pre-wedding portrait series. With the limited time, we sketched out a layout where the lighting equipments, groom & bride and Ducati bikes are going to be. The idea was to shoot with low ISO (meaning less grain when it is printed on a large canvas), we managed to keep it around ISO 400.